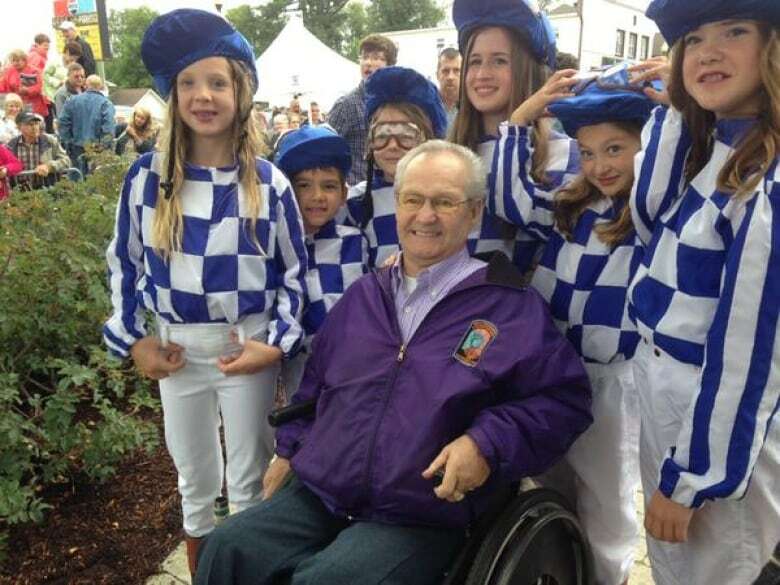 Horse racing legend Ron Turcotte was honoured by the Town of Grand Falls with the unveiling of a monument on Sunday. 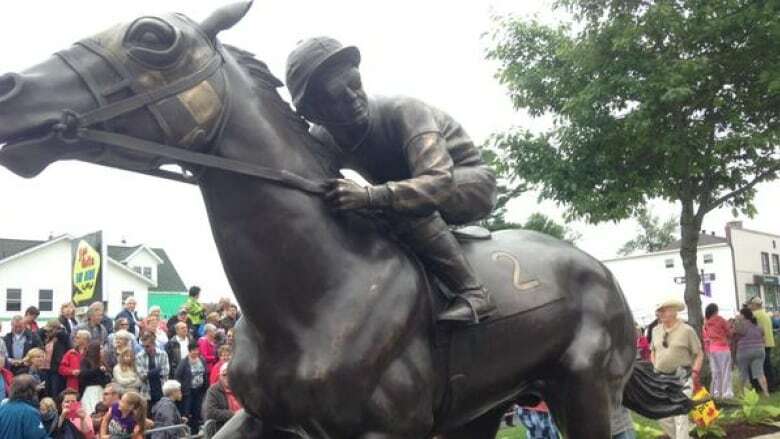 The bronze statue is of Turcotte on the famed horse Secretariat at the finish line of the Belmont Stakes to capture the Triple Crown in 1973. Turcotte told the hundreds of people at the unveiling that he's the luckiest man alive. "I have received many awards and trophies from all over, but to have my own town honour me in this way is very special to me and my family," said Turcotte. "It is very touching, believe me. It made me cry a few times there." Girls dressed in the blue-and-white checkered colours of Meadow Stable that Turcotte wore riding Secretariat helped with the unveiling of the statue. Turcotte's granddaugher Lindsey Smith is directly behind him. (Julianne Hazlewood/CBC)Girls dressed in the blue-and-white checkered colours that Turcotte wore while riding Secretariat helped with the unveiling. One of them was Turcotte's granddaughter Lindsey Smith. "It just makes me feel like a part of him somehow," she said. The statue cost $300,000 and has been years in the making. 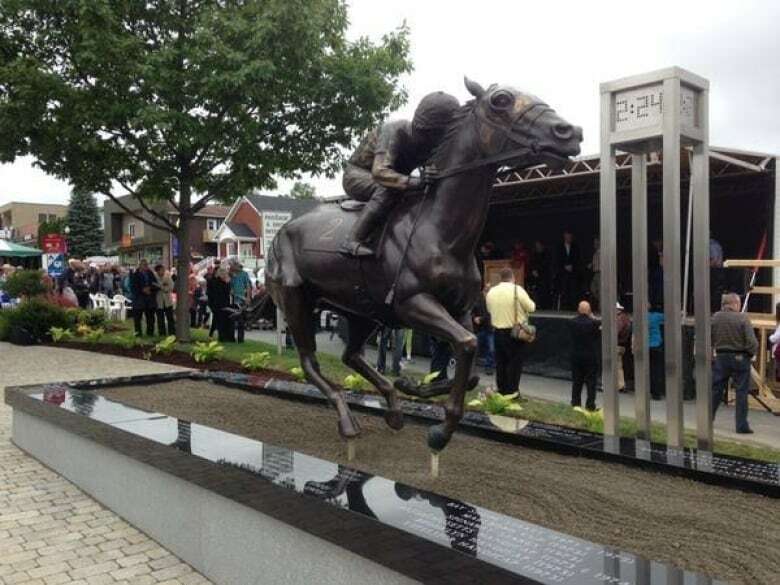 Turcotte and Secretariat have also been honoured with monuments in Kentucky, New York and Calgary. To Turcotte, the Grand Falls honour is special. "Being immortalized now, two places in Canada and two places in the United States, but in your hometown, it's special," said Turcotte. Winning the Triple Crown by capturing the Kentucky Derby, the Preakness and the Belmont Stakes is a rare feat. Secretariat was the first horse to do so in 25 years with record-setting times in all three races that still stand today. There have only been three other Triple Crown winners since 1973, including this year's win by American Pharoah. Turcotte lives in the Grand Falls area. He returned there to live after a racing accident in 1978 that left him paralyzed from the waist down. Turcotte's brother Gaetan Turcotte says he is the most courageous person he knows. "Never once did I hear him say, 'I'm not going to get up again, I'm not going to try again,'" said Gaetan Turcotte.